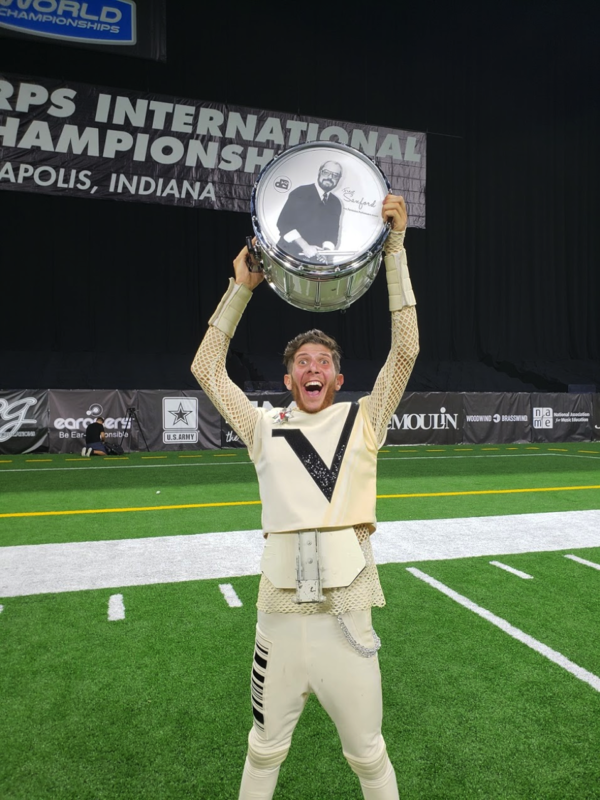 One mid-August day, I woke up from a dream where I was drumming in a sold-out performance at Lucas Oil Stadium in Indianapolis, in front of thousands of adoring fans. Except it wasn’t a dream. It actually happened a few days before. That August day, the other 153 members of the Santa Clara Vanguard (SCV) and I took to the field to deliver the final performance of our show, “Babylon,” at the 2018 Drum Corps International World Championships. We poured our hearts out and, beyond our wildest hopes, were crowned “World Champions.” It was a dream come true, and I was over the moon. Then I returned to Santa Barbara. Since UCSB has not had a football team for many years, the school does not currently field a marching band. But thankfully, when I found myself yearning to scratch my musical itch, classes in the music department offered an outlet for me to nurture this part of my identity. One class I took in the department, Film Music Cognition, explored the intersection between film scoring, cognitive science, and psychology. Another class, Middle Eastern Percussion, was more hands-on, teaching us how to play the dumbek, a goblet-shaped hand drum, and the frame drum, a drum head on a circular wooden frame, which are two popular percussion instruments of the region. The Music department is not my only creative outlet on campus. Last quarter I took a class through the Film and Media department, Soundtrack Media, during which we analyzed a myriad of film scores and soundtracks, like Ennio Morricone’s score for The Good, The Bad, and the Ugly and Erich Korngold’s score for The Adventures of Robin Hood. Although we have no marching band, I continually meet people, not only in the arts but from a variety of academic disciplines at UC Santa Barbara, who were either in marching band in high school or even marched with a drum corps. After watching my roommate from Freshman year perform with the school’s Wind Ensemble, I saw one of the performers wearing a jacket from the Santa Clara Vanguard and promptly introduced myself. During the orientation for my current job at Career Services, I learned one of the current employees marched with the drum corps Pacific Crest for the past few years. I even found, by pitching the idea for this article in my Journalism class, that someone in the class is a fan of Drum Corps International. After that eventful mid-August day, I was nervous that with my drum corps career coming to a close, it would be a challenge to express myself artistically. But, to my delighted surprise, the music and film departments came through and continue to provide me with creative outlets. Michael Hall is a third-year student at UC Santa Barbara, majoring in Film and Media Studies.